My latest efforts. Note the fancy 4-string tie. Since I seem to be spending January talking about what’s going to come and updating where this blog has been, it seems sensible to talk about one of my ongoing projects: curing and drying our own in-house lonzino. To bring everyone up to speed on what this is, a description is necessary, since it’s not a very well-known commodity. If you need to know more by way of background, click HERE to read the first part of our ongoing series about this delicacy. Clear now? One thing that got me interested in making this less-know Italian delicacy is the fact that I really like well-made bresaola (something I’ve yet to try my hand at – unexplainably). Our household also likes peameal bacon, a Canadian specialty, which can most easily described as pickled pork loin that’s been rolled in cornmeal. Sounds not as appetizing as it is, doesn’t it? Think of it this way: corned beef is pretty much the same thing – and who doesn’t like corned beef? Sliced thinly and fried up, then served on a fresh hard roll, there’s nothing quite like a peameal bacon sandwich. (If you ever visit Toronto’s St. Lawrence Market, Paddington’s Pump and the Carousel Bakery make worthy versions). As far as lonzino goes, though, it is a lovely thing when it’s made well. My first attempt, as noted in the above linked post was slightly less than successful because it dried too quickly. Once we figured out that higher humidity than our basement generally produces was necessary, our subsequent batches have been things of loveliness and have become a favorite gift to pass on to friends. Now that we have a professional meat slicer (our Avantco 9" deli slicer), things are even easier – and more professional in appearance. Being an inveterate recipe tinkerer, each time making it (8 now) has seen one thing change in the cure. We started with mattikaarts.com’s recipe, then took a bit of a left turn based on what flavors and aromas we like in our cured meats. The current herbs and spices I’ve used are simply lashings of fennel seed, black pepper, juniper berries and fresh bay leaf. 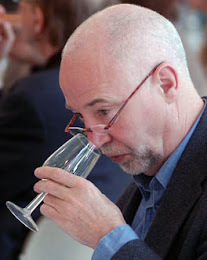 What I changed up this time out was to toast it all to change and intensify everything – especially the aroma, it seems. I’ve resisted sampling the results since the two pieces of lonzino were only hung to dry a week ago, but it does smell incredible. Once I’ve settled on our recipe, I will share it here. I’d be interested to see what other people think. My one other nod to experimentation in this batch was to cure it for slightly less time. We don’t appreciate salty salume around here, and my previous two batches of lonzino were a tad on the salty side, not badly mind you, but less would have been even nicer. One of the main reasons commercial products tend to be so salty is that the manufacturers are trying to disguise the flavor of inferior ingredients. Since we’re going the extra mild to source humanely-raised and butchered pork, why hide its exquisite flavor? To make sure everything is safe for consumption considering it was a bit less cured, I used the requisite amount of curing salt based on poundage. Again, this is something I don’t normally use because I’m lonzino is a whole muscle meat. Another reason to use curing salt where I don’t in bacon or guanciale, for instance, is that lonzino is not cooked before eating, much like prosciutto. The last thing I want to do is kill my guests with tainted meat. Botulism is not fun. Update: I wrote this piece last Thursday and since then the lonzino is drying quite nicely. Currently it’s lost 20% of its weight. The goal is 30% and we might reach that by Sunday. I can’t wait to taste this batch! Addendum: You’ll notice some white on the casing of the righthand piece of lonzino. This is white mold and something that’s encouraging to have on this or homemade sausage you may be drying. This kind of mold discourages the formation of bad mold (green and especially black mold) and also slows down the drying of your meat. This is a good thing (as noted above). I’ve also heard tell that white mold also improves the flavor. Not having enough experience of that, I won’t comment – but it would be nice to know! 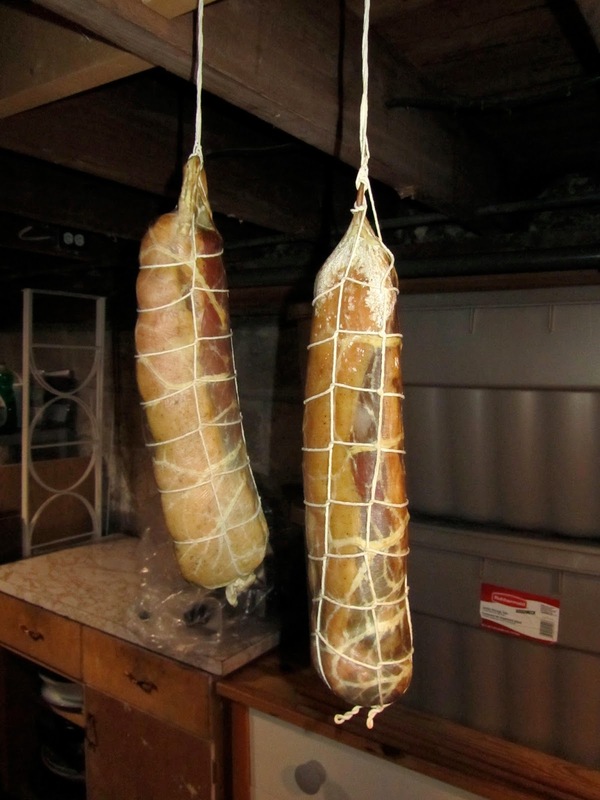 I just received an email from someone asking about how to do the fancy string tying I used on the lonzino. I'll need to do a video on it because my drawing skills are at the stick figure level. To do a video, though, I need a bit more practice to smooth out the technique. Believe me, it's not hard to do, but there are rather long strings to deal with when you begin and they can tangle a bit. Once I work it all so it looks as if I know what I'm doing (I do now, but to watch me, you wouldn't know it! ), I promise I will post a video. In the meantime if you're making lonzino, just use the two-string version and there are plenty of how-tos on the Internet to advise you.